As a relatively new Crestron dealer (three years) and even newer programmer (one year), I was interested when I started seeing marketing for a product called P|D ADAPT. While there isn’t much information on the website yet, it looks like it is an interface for programming a full Crestron system in SIMPL Windows without having to code line by line. In this sense, it appears to be a database of common programming parameters that allow you to configure and adopt a program to a specific project simply and faster than you could historically. You will still need to know SIMPL and feel somewhat comfortable with using it, but by layering on ADAPT, the time to implement a system is greatly reduced and changes are much easier to make in the field in the future. The system integrates AV, lighting, shading, security, door locks, cameras, thermostats, touch panels, keypads, handhelds—pretty much anything you can think of for a home automation system. The developer of ADAPT, PanTech Design, has been a Crestron programmer for years and understands the challenges faced on a daily basis. But PanTech’s founder, Troy Morgan, who also worked for Crestron for six years, has experience on the sales side as well, so he knows how scope change can happen with a client and how that can impact the programming and system deployment. 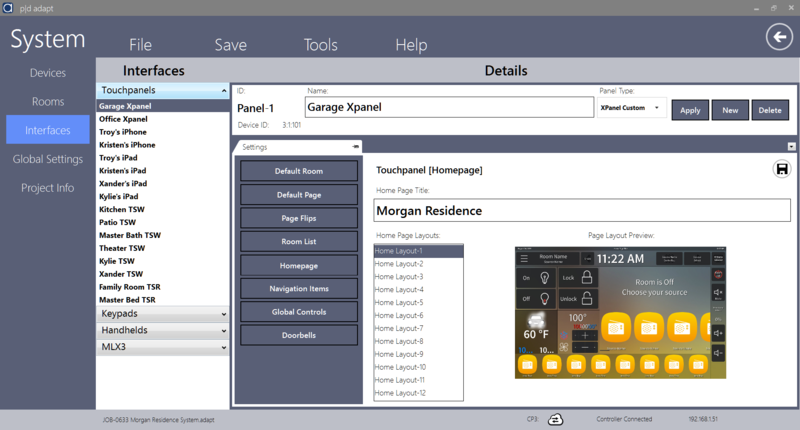 ADAPT has partnered with NT Designs so that dealers can commission custom themes for their user interfaces. While that will be more than sufficient for most dealers, many programmers are very creative and write elegant code so they may not be interested in a more standardized approach, which is also available. I can see two main audiences for ADAPT. For the experienced programmer, ADAPT appears to give you the ability to modify and tweak a system without the more involved steps in programming. Even programmers that have developed their own templates and databases know that each project is different and requires some form of customization; ADAPT makes that a more streamlined process. For the dealer that primarily relies on third-party programming, ADAPT will provide a way to get in and get out quicker, especially when it comes to updating existing systems or adding in new components. There will always be a need for customized, specialized programming, but I could see using ADAPT to take care of the meat and potatoes jobs and using specialized programming resources for the more complex scenarios. Check out PanTech Design at CEDIA Booth 8026 where the company will be hosting a couple of special guests.